An attractive medium sized tree with a natural pendulous habit Pinus patula is commonly called the Mexican Weeping Pine. It make a good specimen tree in larger gardens and parks and can also be used as a barrier tree on larger properties. The flowers are insignificant and are followed by large pine cones. An added feature is the attractive bark on mature specimens. Good specimens can be seen in the Geelong and Melbourne Botanic Gardens as well as in Canberra in various localities. Being both drought and frost tolerant this is also a long lived tree. It grows well in a range of soil types as long as they are well drained. Plant in a well drained soil in a sunny position. Water in well and provide some extra water during long dry spells for the first two years. Mulch around the plant to maintain a cool moist root run. Propagation is usually from seed. 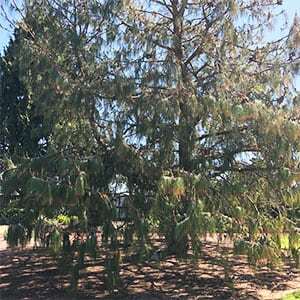 Common Name – Mexican Weeping Pine. Height – To around 15 metres. Foliage – Mid green, typical pine needles.